The criminal foolishness of advocating war against Iran is rather obvious. Senator John McCain, US Naval Academy ‘58, is a criminal fool by anyone’s definition to advocate launching a war we would certainly lose, as he so recently did from the floor of the Senate. This is obvious and the failure of anyone in the mainstream media or politics to put it that openly and plainly demonstrates these institution’s profound failures. At least Professor Juan Cole offers a valuable—if limited–corrective. Cole and his blog, Informed Comment, are both damned good and have been among the best sources of intelligent reportage and analysis of events in the Middle East. But I’ve got a bone to pick with him on one of his latest posts, about the costs of a potential war with Iran. Cole was prompted to write this piece by McCain’s idiotic remarks on the Senate floor about how the United States should stop negotiating with Iran on its nuclear programs and just declare war on them and be done with the Iranian nuclear problems for once and all. Juan Cole came up with the rejoinder to McCain’s stupidity by pointing out that Iran is a country three times the population, and size, of Iraq, and multiplying the monetary and casualty figures of our war with Iraq by three as a salutary reminder of what such a war would cost us and the Iranians. The numbers weren’t pretty. War is the most complicated, difficult, and unpredictable of human activities there ever has been and reducing it to simplistic formulas like Mr. Cole did always drives the militarily knowledgeable howling mad. Simplistic calculations by amateurs are always wrong and it is terribly dangerous when they get repeated, which generally happens, as a simple clear wrong answer is generally preferred to a complicated lengthy uncertain answer by most people, politicians in particular. Predictions of a war’s likely costs, like Mr. Cole’s, can be made by qualified military staff professionals with a good deal of accuracy provided that a large amount of skilled staff time and effort are put into the research. Mr. Cole doesn’t have the skills or time for this question. His numbers are almost meaningless; a calculation this simplistic is certain to be wrong. I say almost meaningless because Mr. Cole’s article has performed an exceedingly valuable service of reminding us how much our past military misadventures have cost us and reminding us of how costly a war with Iran is likely to be. We seem to have already forgotten this first set of facts. In our defense, it isn’t like many of our political leaders ever bothered to bring them to the fore, and our news media doesn’t seem too troubled by their failure to publish or discuss them either. Mr. Cole’s article has the same admirable and commendable spirit shown by the Marine Corps’ Commandant at the time, David Shoup, to the JFK White House political staff about invading Cuba. Back in the post-Bay of Pigs days talk of that invasion was rife in DC; it was almost a given in DC political quarters that we were going to have to invade Cuba to ‘solve’ the ‘Castro problem’. General Shoup made a presentation to the White House civilian staffers of a flip chart map of Cuba, saying that this map showed the size of Cuba. General Shoup then flipped down a transparent overlay with a tiny red dot on it that was barely visible against the mass of Cuba. Shoup next pointed out that this dot represented the size of Betio Island, which he’d help invade at Tarawa in 1943*, which cost the Marine Corps 5000 casualties in 72 hours. Shoup’s sobering presentation was met by silence by the White House staffers, who had never considered things from this angle before. Chroniclers of the Kennedy Administration** record that enthusiasm for invading Cuba rapidly diminished after this presentation. I’m going to claim greater military expertise than Mr. Cole and venture my semi-amateur opinion about a war with Iran. Mr. Cole’s casualty figures are way too low. The key factor overlooked is the much greater willingness to fight against a US invader that Iranians have that Iraqis lacked. The Iranian military forces would fight far harder than their Iraqi counterparts and the Iranian population would not collaborate with a US invader the way that a fair percentage of Iraqis did in the initial year or two of our occupation. Significantly, the Iranians now have the example in front of them of how to fight a lengthy war against a US invasion and occupation and they will have learned the appropriate lessons from it and will apply them against our invading forces. Mr. Cole also overlooks the fact that the US, far worse than was the case in Iraq, lacks the infantry strength to sufficiently occupy Iran should we invade it. Likely enough we don’t have the infantry strength to conquer the country in the first place. These are the military facts. The military-political conclusion that has to be drawn from them is that any war against Iran is one that we would lose. This is particularly obvious when you consider the fact that we lost our two most recent wars against smaller, less motivated opponents than Iran. No qualified professional military analysis of these facts could ever come to any different conclusion. 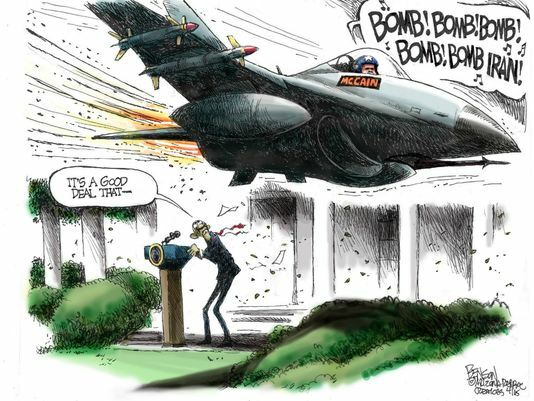 It’s worth a few words at the notion that we could just have the Air Force bomb the Iranian nuclear facilities and solve the problem that way. The first defect to this is that the Air Force has never managed to completely destroy any industrial target in its history. Much less destroy one to where it couldn’t be rebuilt. The second defect is the glad willingness of persons advocating this in ignoring two salient facts. The first is that by doing this the US is performing a Pearl Harbor on the Iranians and it must be expected that the Iranian nation would react the same as we did in ’41. They would not take this lying down and would respond most strongly. The second is just what we are supposed to do next, after we’ve bombed the reactors and the related industrial areas and killed thousands of Iranians and contaminated a large swath of their country with radioactivity. We will have started a war and will be bound by events to prosecute it or seek some sort of settlement of it through diplomatic means. As pointed out above, we cannot militarily win such a war and diplomatic efforts to negotiate a peace with a country you did a Pearl Harbor on seem rather unlikely to yield a successful result. There is also the factor of wars of aggression being illegal under international and US law both. The notion that we could bomb the Iranian nuclear facilities and ‘solve’ the ‘problem’ that way is an infantile inversion of The Mouse that Roared. Our bombing Iran without a plan (much less the means) for militarily defeating it and changing permanently its political direction—just bombing away and ‘solving’ the ‘problem’ that way—is launching the US into uncharted political seas. There never in history has been a case of two distant countries being at war with each other with one lacking the means to attack the other, and the other lacking the will to***. I can make no prediction as to what would happen then but I do know that the diplomats will certainly have their work cut out for them to try and solve it. The failure of our media and political system to have ever brought these matters up when the bombing of Iran is discussed proves these institutions in our society are exceedingly broken. The problem is deep within us and we need to face up to it. Growing up isn’t easy, America. But the high costs of remaining a child make it necessary. The alternative—listening to the incessant and criminal bawling of childish ‘men’ like John McCain—is simply unbearable. Daniel N. White has lived in Austin, Texas, for a lot longer than he originally planned to. He reads a lot more than we are supposed to, particularly about topics that we really aren’t supposed to worry about. He works blue-collar for a living–you can be honest doing that–but is somewhat fed up with it right now. He will gladly respond to all comments that aren’t too insulting or dumb. He can be reached at Louis_14_le_roi_soleil@hotmail.com. *Shoup won the Medal of Honor at Betio (Tarawa). He went on to be one of the few principled general officers, alongside Gavin and Ridgeway, who spoke out against the Vietnam War. **David Halberstam tells this story well in his The Best and the Brightest. ***In the case of Israel versus Iran, we have the case where both countries lack the means to wage war against each other, due to geography and lack of military resources. Israel also lacks the means to successfully ‘bomb-solve’ the Iranian nuclear ‘problem’, unless it uses its nuclear weapons. Israel just doesn’t have the airplanes to do it. I suspect that the Israeli generals to some degree understand this but it is obvious enough that their politicians and news media clowns don’t any more than ours do. Which accounts for their dumping an endless toxic load of their Iran threat/war hasbara over here on us. ****As is threatening other people with something you can’t do, that you know you can’t do, and that they know you can’t do. ← Are Troops Being Evangelized Instead of Being Treated for PTSD? If it was “just” a matter of bombing all known and suspected Persian nuclear labs, Israel would be happy to carry that out. I think Netanyahu must have wet dreams about doing just that, in fact. And Obama, under ‘Bibi’s withering attack since the “deal” negotiated with Iran, just publicly vowed as loudly as possible that US resources will be thrown into the fray if Israel gets into a war. Any damned war! A US war on Iran would start with weeks and weeks of heavy aerial bombardment, after taking out all radar installations and destroying as many aircraft on the ground as possible. But then, as Mr. White correctly points out, a physical presence on the ground–“boots” as they say nowadays–is necessary to occupy a nation’s territory and install a puppet regime. That’s when the US casualties will mount. Some Persians doubtless would welcome the US invaders as “liberators,” but it doesn’t take a genius to predict that in general the reception will be hostile. But will any of this prevent “our” government from pressing ahead with such actions? Does recent history give the least hope that common sense will prevail over hubris, testosterone and the good ol’ “can do!” spirit??? To ask the question is to answer it, methinks! The idea that war against Iran is desirable, let alone justified, is too mind-boggling for me to begin to comprehend. It seems to me to be quite literally insane. Is there a nation on this planet that is led by realists? So many things are in one stage or another of crisis right now and there exists no leadership anywhere on the globe, at least to my eye, capable of dealing with any single one of them rationally. Every response is to intensify all the currently failing policies, ramping up levels of violence while increasingly quashing dissent against leadership elites. Every sh!t condition presently underlying societal turmoil, wherever one chooses to look, is a condition about to be exacerbated by climate change to a degree far past a minimum requirement for total civilizational collapse. I can’t summon optimism for future leadership response, when crisis situations are substantially more severe than right now, given current human ineptitude. The world’s shot-callers, and by that I mean the few hundred economic elites pulling the strings of elected marionette’s, are in completely over their heads. They are too ignorant to occupy their positions. Worse, it is all but impossible for them to ever realize this. Reblogged this on Sgt. Hack's WordPress Blog.